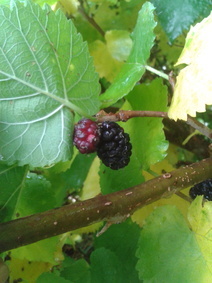 Is this an edible Boysenberry or Blackberry Tree? 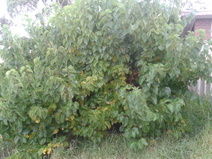 Or is it just a wild berry tree? 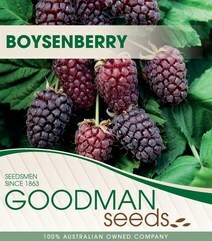 I would guess Boysenberry - simply because the berries appear to be growing off a tree rather than a bush! 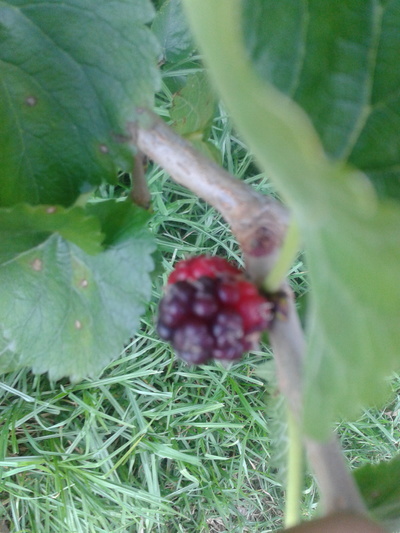 I have seen some images of blackberry and boysnberry.They seem to hang from a little stem which this one doesn't.So i'm not sure if it's edible. I have seen images of Boysnberry and they all hang from a little stem which i don't seem to notice in this one.That's why i'm wondering if it's edible. Judging by the leaves and general structure of the berry heads I would guess it's neither... 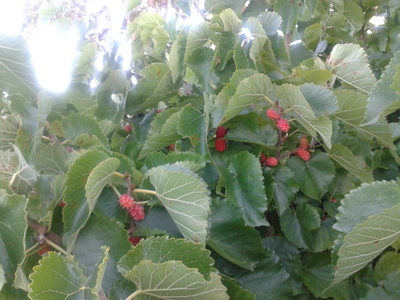 Some variety, cross-bred species is my guess..
That looks like mulberry's. I remember seeing and eating those in South Africa. This is what boysnberry looks like.Mine deos not have the little stem. 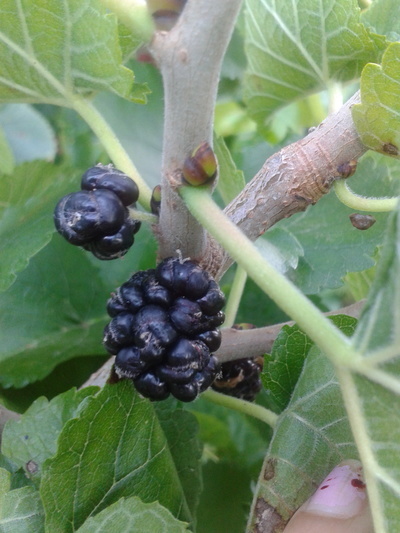 The tree is a mulberry Tree (Black Mulberry) there is also a White Mulberry Tree considerably more vigorous growth habit the leaves are a lighter green and are famous as the food of the silk worm, the also fruit but is suitable for the birds they are very small. The new highbrows produce fruit larger than your thumb. It is a long lived productive tree a treasure in any garden, it grows at approx. 36 cm per year if adequate water and a little general complete blood and bone is added at the drip line.. You may have to net the tree to get your share of the crop. This plant is a Mulberry (Black) Morus Nigra a large long lived tree that will grow to 15 mrs and cover 45 metres the tree is grown for its fruit unlike its close relative the white Mulberry Morus Alba a large short lived tree that grows to 15 metres + which is grown for its leaves to feed the silk worm a straggly tree so if not feeding silk worms don't bother. All in all this deciduous tree is grown for now and many generations to come it is drought, disease and frost resistant very suitable for Australian conditions, for the larger gardens. I have recently planted 4 grafted trees and they are growing splendidly. They like water when available and a complete blood and bone fertiliser literally spread around the drip line and battered in twice a year will reward in a way that sill astound you. My top 10 trees for future generations. I would wait till the spring rains and use a complete blood and bone fertiliser with trace elements and liberal cast the fertiliser about the base of the tree some 2 feet from the trunk to just past the drip line. I would recommend for your tree approximately 2 pounds of fertiliser per foot of height. This may sound a lot but it needs only to be done every other year. The trees are incredibly hardy and I have seen them grow in very dry areas without any fertilising for decades and produce good crops of large fruit, feeding and water in very dry areas will assist the plant and crop considerably. Blood and bone organic fertiliser with trace elements are also worm friendly as are the manure based fertilisers these however often lack a balanced trace element component as the raw material is usually sourced from feed lots. 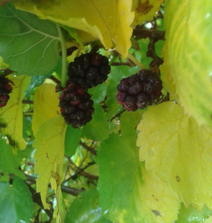 This is not a blackberry or a boysenberry shrub, I picked many of these berries as a kid for pies and they were very prickly with thorns, which are missing in these photos.